Welcome to Big Les, our new rooster, thanks to Jessie. 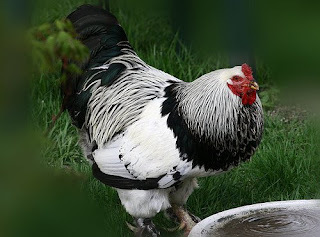 He’s a light brahma, and matches four of our hens. Our hens, by the way, are all named Shirley, after Brad’s mom, at her request. So, it was only fitting that we name the new rooster after his dad, Lester, or Big Les as he was known to his friends.